Wow. I'd often use words like pretty, beautiful, fun or cute to describe a fashion shoot, rarely do I use the word breathtaking but this is one of those times. 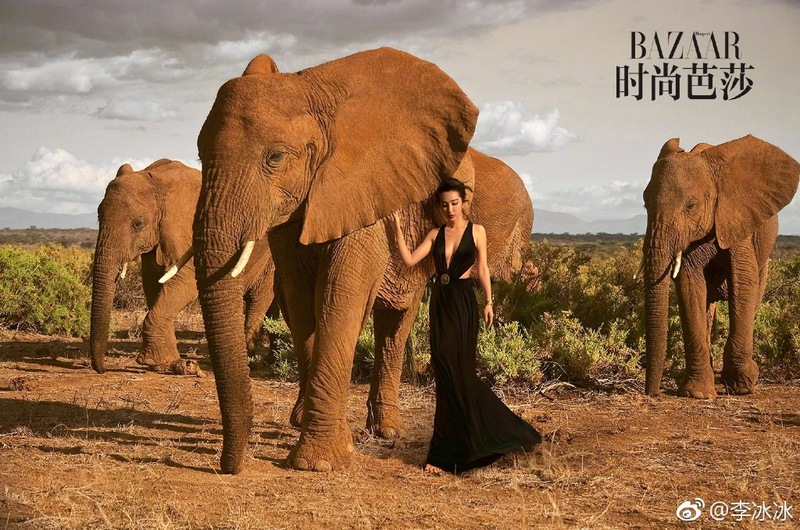 The 44-year-old Chinese actress Li Bing Bing graces the April Issue of Bazaar China alongside Tibetan antelopes, a cheetah, a Hyacinth macaw and elephants. There's a deeper message behind the extraordinary participants as Li Bing Bing seeks to promote the #WildforLife campaign, an advocacy working to protect endangered wildlife against illegal trade. She takes the mantle as a UN Environment Good Will Ambassador alongside famous personalities like Don Cheadle and Ian Somerhalder to promote a noble cause. She shares on weibo, "In my thoughts there has always been a picture: in the vast land, every life, including people, respecting each other, co-existing, small yet grand, unique yet equal, that is my heart's desire. Thank you @BazaarChina for joining me in #WildforLife, hope all life will be treated with kindness. 🐐🐆 🐝 ​​​​ ​​"
Wow! That is a stunning photoshoot!